Angelababy (楊穎) and Lynn Hung (熊黛琳) walked the red carpet of the 9th Annual Huading Awards held in Hong Kong, China on April 10, 2013. 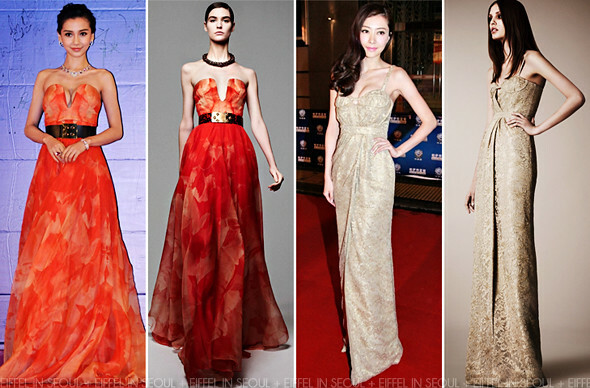 Angelababy (楊穎) wore a red floral print bustier gown from Alexander McQueen Spring/Summer 2013 collection. Silver jewels to glam up her look. Lynn Hung (熊黛琳) was dressed in a beige lace gown from Burberry Prorsum Resort 2013 collection. Her beautiful look was completed with a side-swept hairstyle. Angela looks like some kind of statue god who has starve to become this weird creature, bones but with breasts? Fake?